After, "What is pillar content?" and "Wait. Oh my God -- you really expect me to write all that?" the most common question I get about pillar content is, "How do I actually measure the success of my pillar?" So, what I am going to share with you today are the different ways you can track how your pillar(s) perform, based on how we do it here at IMPACT. What goal(s) do you have for your piece of pillar content? While, for the most part, the keyword you're going after with a piece of pillar content will have high search volume, there may be cases where you are choosing to go after a keyword you believe will have high search volume in the future -- meaning, you're trying to own a keyword now. If that's the case, you probably shouldn't be hyper-focusing on traffic and expecting meteoric growth. Instead, you may want to zero-in on promotional strategies and beefing up your topic cluster. Are you measuring the topic cluster or the pillar content alone? Remember, as I alluded to above, a content pillar is not meant to be a standalone work of art -- it should be the beating heart that lives at the center of a much larger, strategically researched content framework called a topic cluster. That means you're going to want to measure the success of both the topic cluster and the pillar content individually, as the onus behind this strategy is to spark growth for all of your interconnected content. However, there will be some cases where you may be building your cluster out over time, instead of "going live" with all of your content assets ready for publication. 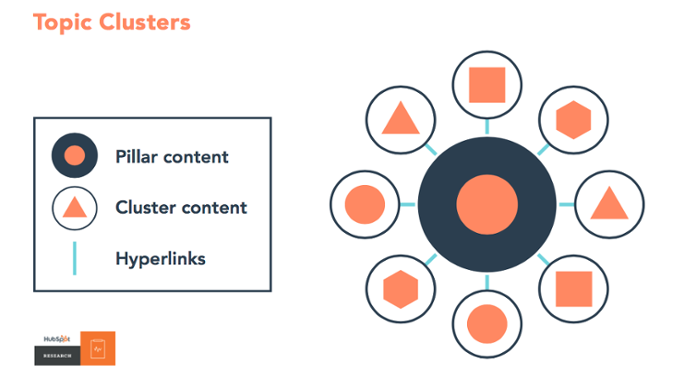 (HubSpot has found the sweet spot for cluster size is in between eight and 22 pieces of connected cluster content.) In which case, you may be focusing more on the success of an individual pillar to start, rather than the overall growth of a cluster. As a disclaimer, while I know there are many different marketing automation platforms out there, we use HubSpot for marketing. If you don't use HubSpot, I'm sure many of the principles behind the reporting tactics that follow below can be applied to your situation. Unfortunately, however, I'm not able to provide guidance on platforms I don't use. OK, with that bit of housekeeping out of the way, let's dive in. This only reports against organically-sourced (probably grass-fed) traffic. There is no report that allows you to have a multisource overview of the traffic your topic clusters are generating -- something that you're probably used to seeing in other traffic reports on HubSpot. This is somewhat annoying. But the thing that really grinds my gears about this report is you can't track total number of page views. 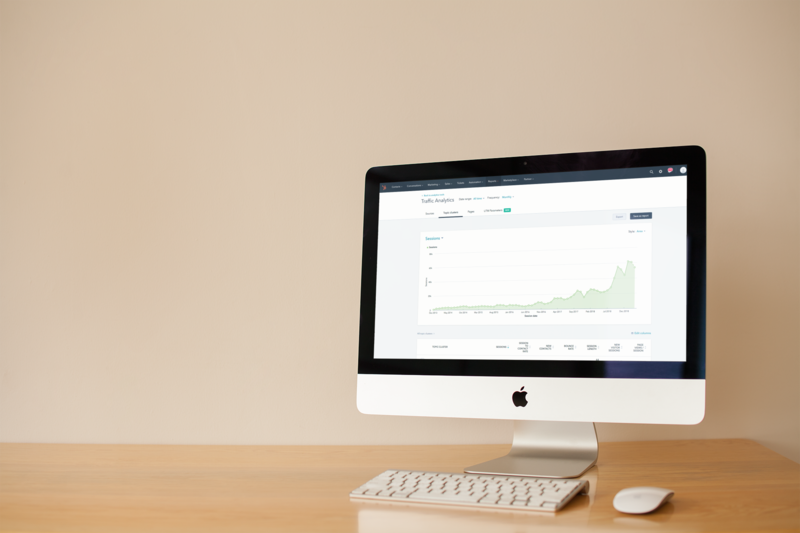 It only tracks page sessions -- a single visit to your website from one visitor that may include numerous page views. Over time, you should see what I'm looking at above -- overall "hockey stick" (up and to the right!) growth with your topic clusters. I look at this report a lot over the first six months after I launch a new cluster. Assuming it's the usual keyword grab, I try to see how a new cluster tracks against those we've already published. If I see something "lagging behind," however that may be situationally defined, I know that's my signal to go back and evaluate the pillar individually, as well as the overall structure and scope of the cluster. Of course, I always need to maintain awareness around how much search volume a particular topic cluster was meant to generate -- some are naturally going to be higher performers than others, because of the search volume for the particular keyword it targets. I also like to look at how all of our topic clusters are performing together -- again, I want them to continue to grow together, month-over-month. Typically, I use a rolling 30-day range in the view I showed above to track that performance, rather than the static month-over-month view, since the length of a month varies. In this report, you can also track page views per session, if you scroll down below the chart -- by default, it'll be the number in the last column. I love this, because it shows me how sticky a particular pillar or cluster is. Meaning, once they land on a single page, they stay on our site to explore other pages, rather than bouncing off. 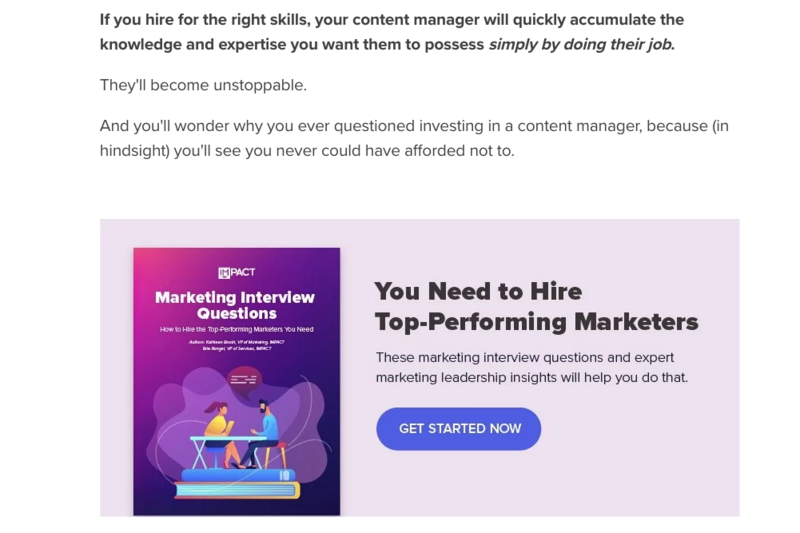 For example, you can access our marketing interview questions pillar from a recent article I wrote about hiring a content manager -- which you need to do, by the way. 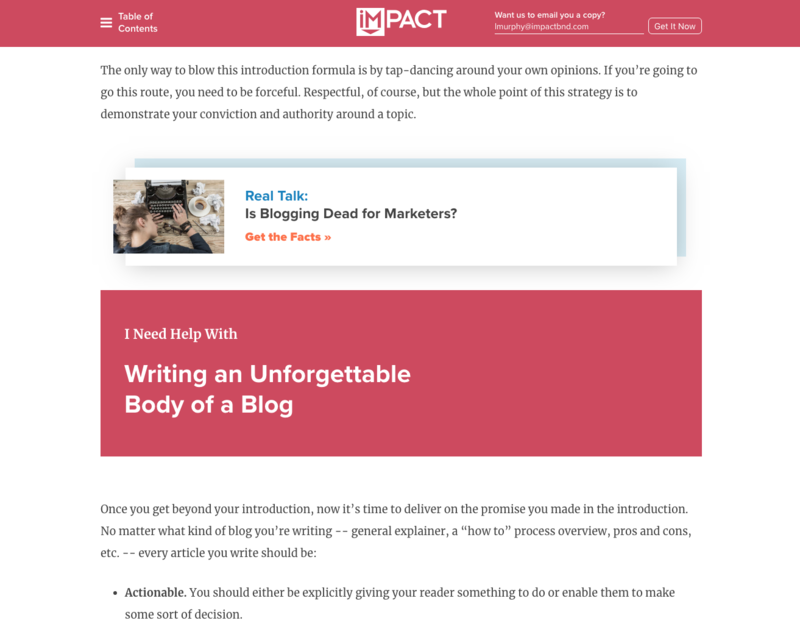 On our blogging tips guide, you'll find called out resources scattered throughout, to take you to relevant, more in-depth content about a particular related topic. I want to thank myself from last fall November 2018 Liz Murphy was really stinking smart, and the most important data I've gotten is because of what I did before I left for Thanksgiving vacation. I had the ridiculously smart idea to create a global HubSpot campaign that was attached to every single piece of pillar content I created. Not clusters, mind you -- just the pillars themselves. I wanted to see how influential these definitive guides were on their own. I've blanked out a few of the numbers, because a gal's gotta have a little mystery about her -- know what I mean? Since our sales team uses the HubSpot CRM to manage their sales pipeline, I am able to track how much money we've brought in for deals where a piece of pillar content was part of the equation. In some cases, "influenced revenue" may simply mean someone looked at one or two pieces of pillar content before closing a deal with us. But in a lot of cases, I found scenarios like the one below. 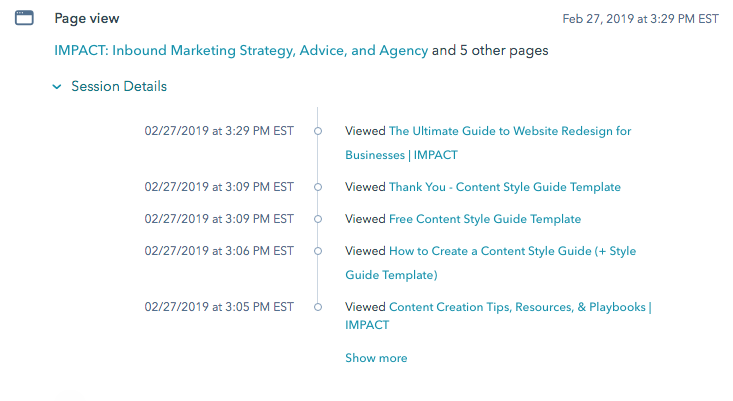 In total, this one person looked at (and, in some cases, downloaded) four different ungated pillars -- content style guide, brand messaging, growth-driven design, and keyword research. Undoubtedly, the pillars we created were a significant factor in this person's decision to work with us, which -- again -- I love, because I can say definitively that the amount of revenue associated with those deals ($10,000+) can be directly attributed to those efforts. In another case, a single primary contact for a prospect viewed and downloaded two different pillars -- website redesign guide and the death of SEO -- less than a month before the company signed a $60,000 deal with IMPACT. Then, there was one instance where a single contact went back to the death of SEO pillar three times -- and nothing else -- over the course of a week before signing two different deals totaling in excess of $10,000. And those are just three examples out of that $190,000+ number of influenced revenue. But had I not created this holistic view in HubSpot campaigns, I would have never known. What's also crazy to think about is that this revenue number is probably much higher, since campaigns only track forward-looking metrics, from the date an asset is added to the campaign. So, if one of our older pillars was generating revenue for us before November of 2018 (when I created the campaign in HubSpot) -- which is extremely likely given that they are some of our most popular -- we can't see that. Please note that this level of reporting is only possible because we use the HubSpot CRM and HubSpot Marketing Hub. Having all of these different tools in one marketing automation ecosystem is why we can track the revenue our content generates. This particular pillar is a workhorse that brings in steady organic and direct traffic, month-over-month. I spend a lot of time looking at this view for the first 90 days after a pillar launches, because this will tell me if something is broken at the core of my topic cluster. Depending on how quickly the great Google machine moves, it can sometimes take a couple of weeks for organic traffic to start ticking upward. If, however, I don't see that eventual pick-up of organic traffic, I know I've got a problem -- and that's something I've had to address. Often, all I need to do is tweak some of the on-page optimization -- playing with the title or the H1s, etc. If that doesn't work, then I take a look at the cluster and my linking strategy. I like to see this number go up over time (as shown above), because that means the content is valuable to folks who are visiting it. If this number is always really low -- less than a minute -- and you have a high bounce rate, you probably have content on your hands that does not address the needs or intent of the people who are searching for that term. The avoid that issue, here is my process for crafting the perfect individual pillar content strategy. Someone from our sales team -- or multiple members from our sales team, ideally -- say that what we've created is an insanely valuable piece of sales enablement content they will start using immediately. 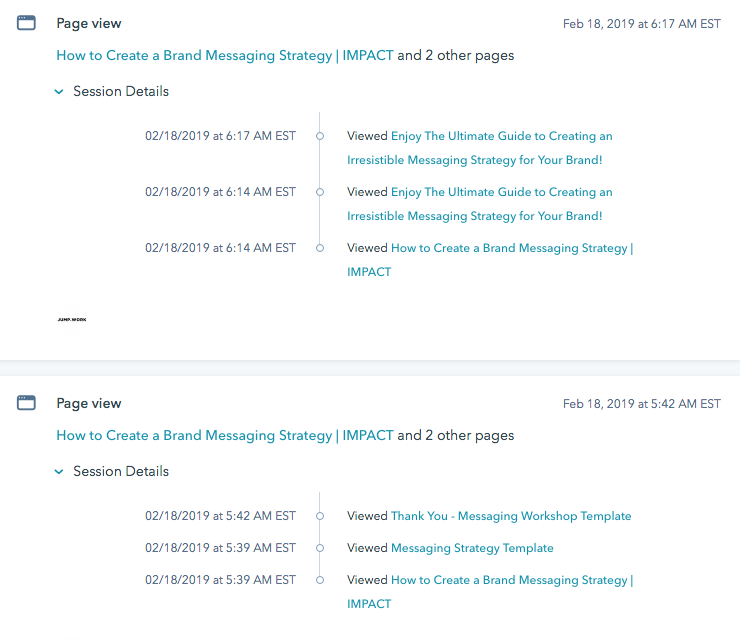 Every IMPACTer is able to use the link to a content pillar they wrote as a way to connect with people they've met at events, speaking engagements, and so on. 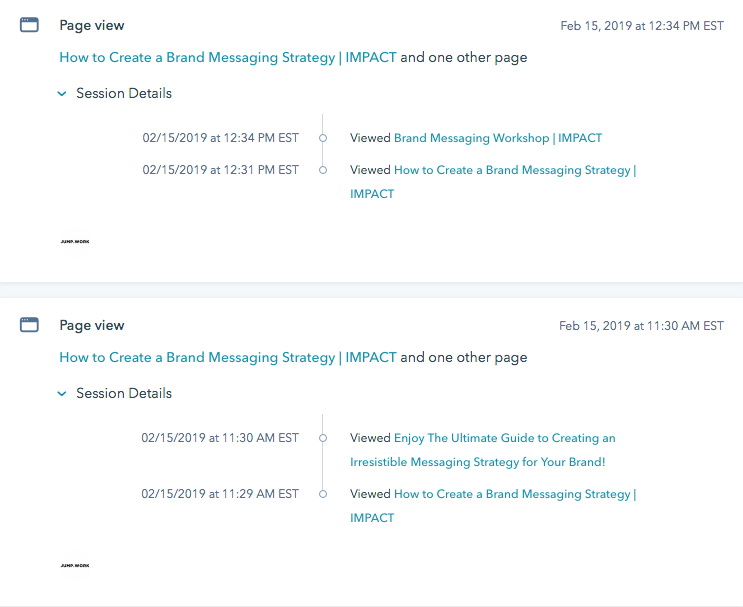 For example, IMPACT Client Success Specialist Myriah Anderson shared that -- after she participated in a SalesHacker webinar as a speaker -- she had an influx of connection requests and messages on LinkedIn. 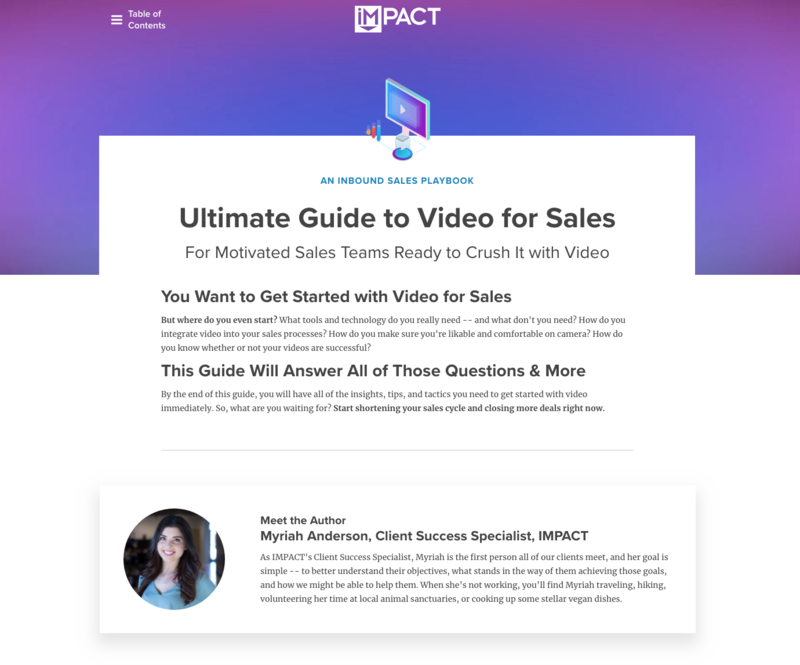 ...Myriah was able to send a link to her video for sales guide as a follow-up to those who connected with her. It appeared more personal and relevant because her name and delightful face were on it, and it was directly related to the topic she was speaking on for SalesHacker -- using video to create wins for your sales team. "Wait, What About the Actual Topic Cluster Reporting Options in the HubSpot SEO Tool?" Yeah, about those... I uh... I don't really use them. I don't find them valuable. Again, this is where I really wish HubSpot had more robust reporting, because the best reports I've got that show how much money our content makes for the business -- which is kind of the point of this whole content marketing thing, right? -- is a random campaign report I made myself. Granted, I love that HubSpot allows me to "hack the system" in different ways to get the data I want. But overall, I find much of the de facto reporting for pillar content and topic clusters in HubSpot to be lacking. I still hate that there is no single view for me to see the number of organically-sourced page views our topic clusters bring in. You can get this number by going to each individual cluster in the SEO tool and calculating it. But not only is that a tedious workaround (given the number of clusters we have), I shouldn't have to do that. 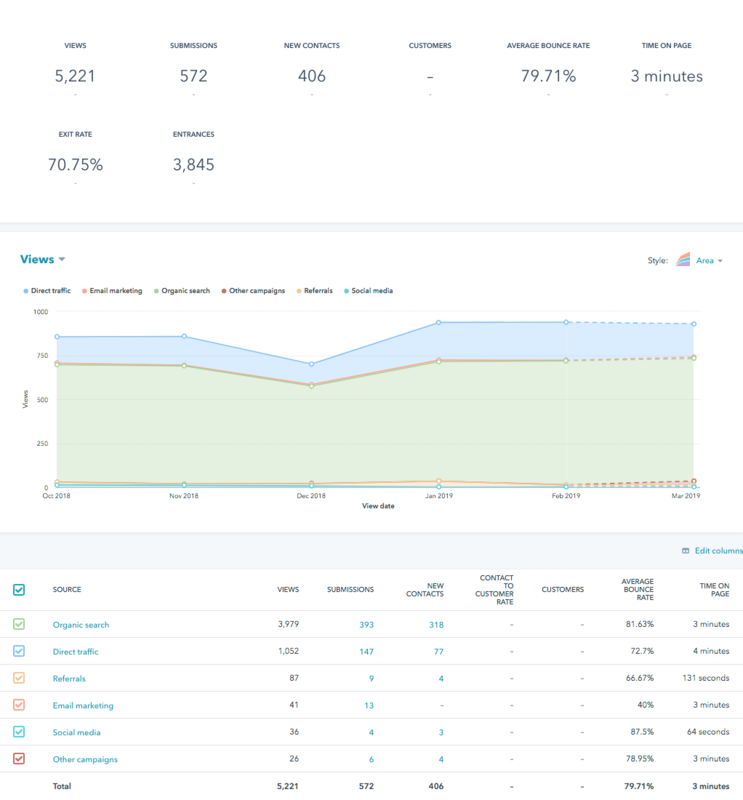 Still, I'm able to track the organic traffic gains, as well as the bottom-line impact ($$$) our pillar content is having on the business -- that last part is a big deal to me considering how much effort goes into building all of them. However, what works for me may not work for you -- although I hope some of this guidance helps. To find the right path of measuring pillar content (and topic clusters), remember to start with your goals first. And never rely on a single metric to tell you the whole story.